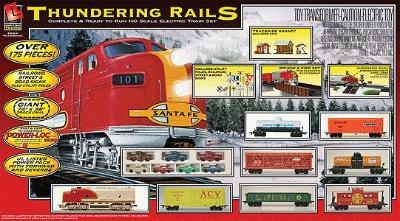 This is a Thundering Rails Sante Fe Model Train Set HO Scale from Life-Like Trains. Retail $182.99 SAVE 24% ! Experience the fun of rolling freight in this exciting set with over 175 pieces! Leading the train is a powered F7 diesel with working light, painted in the classic Santa Fe red and silver scheme. Six colorful freight cars are next, followed by a red Santa Fe caboose. Adding to fun is a complete up-and-over bridge pier set, three trackside shanty kits and a working crossing gate, plus four automobiles and three pickup trucks. There are 110 railroad, street and road signs, along with 12 utility poles to build all kinds of highway scenes. Designed for easy assembly, the set includes a 74 x 38" 1.8 x 0.9m oval of Power-Loc track, which simply snaps together. Plug-in terminal wires and a UL-listed power pack are included, along with replacement couplers and complete instructions.